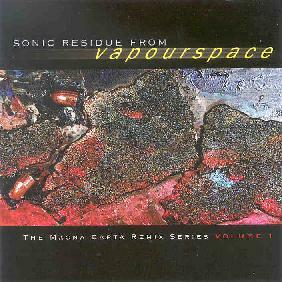 Mark Gage - "Sonic Residue From Vapourspace: The Magna Carta Remix Series Vol. 1"
Mark Gage, who records under the name of Vapourspace, is a studio wizard whose philosophy in remixing is not to add any newly recorded material to the remixes. He mines only the source material, manipulating it in his studio, and morphing it into a different piece of music, even though it has similarities to the original. On this album, he's remixed 10 pieces of music by different artists on the Magna Carta label including Niacin, Liquid Tension Experiment, Steve Walsh, Steve Morse, and other familiar artists. The result demonstrates the possibilities inherent in the connections between prog rock and electronica. I don't think it's a coincidence that we've seen a resurgence in the popularity of prog rock through the late 90's, concurrent with the rise in popularity of electronica. Artists such as pioneers Tangerine Dream and Jean-Michel Jarre, who are considered forefathers of the electronica genre, have always been associated with progressive rock as well. So it would seem that the modern progressive stylings found on the Magna Carta label would be perfect candidates for the Vapourspace treatment. And to a great extent, it works. I would have liked to have heard the originals for comparison, but alas, the only ones I had were the two Liquid Tension Experiment tracks. My favourite on the album is Gage's remix of the Led Zeppelin inspired Steve Morse track Led On. (wow, music has become a strangely recycled beast, hasn't it? A re-mix of a track by one artist which was a tribute to the sound of another artist - there's a whole article in that, I think - maybe next issue). Anyway, it's a trippy piece with ethnic percussion and loads of acoustic sounds (apparently the original covered every aspect of Led Zeppelin's sound, including hard rocking, but Gage chose to just focus on the acoustic parts-a good decision, as the nature of electronica is to find a groove and stick with it, improvising around it, rather than changing the structure or sound dramatically halfway through). Another nice track is the remix of Jenny Nettles by Tempest, which has a laidback, groovy feel and eventually dissolves into a moody, ambient coda. Melt (Bozzio, Levin, Stevens) is the strangest number on the album, and has a very liquid feel to it. Since I haven't heard the original, I'm assuming Gage has treated the sounds in the studio, processing them into something very different from what they were originally. Most of the tracks are instrumental, but there's a couple of vocal tracks on here: Time Enough by Explorer's Club and Kansas by Steve Walsh (another sort of tribute to a progressive rock band - but at least Steve Walsh was a member of Kansas!). The vocals remain pretty much intact while it's more the music underneath that Gage plays around with. I'm not too sure about this. The quintessential electronic music sound has always sounded better to me without vocals. For me, remix albums have always been more or less a novelty. They're interesting to listen to once or twice, but they tend to have a short shelf-life, and I always return to the originals. I can't really say I feel too differently about this album, even though I haven't heard most of the originals it was based on. What it does make me want to do is find the original tracks and hear them. I guess my question is, is it art? If I cut up a Van Gogh painting into little bits and re-arranged them on the canvas, would that be a new work of art? I guess that's up to the individual listener (or viewer) to decide. But I'm glad to see that Magna Carta are experimenting, always searching for new musical ideas to explore.